Scientists at the U.S. Department of Energy's Ames Laboratory have developed a method to accurately measure the "exact edge" or onset at which a magnetic field enters a superconducting material. The knowledge of this threshold— called the lower critical field— plays a crucial role in untangling the difficulties that have prevented the broader use of superconductivity in new technologies. In condensed matter physics, scientists distinguish between various superconducting states. When placed in a magnetic field, the upper critical field is the strength at which it completely destroys superconducting behavior in a material. The Meissner effect can be thought of as its opposite, which happens when a material transitions into a superconducting state, completely expelling a magnetic field from its interior, so that it is reduced to zero at a small (typically less than a micrometer) characteristic length called the London penetration depth. But what happens in the gray area between the two? Practically all superconductors are classified as type II, meaning that at larger magnetic fields, they do not show a complete Meissner effect. Instead, they develop a mixed state, with quantized magnetic vortices—called Abrikosov vortices— threading the material, forming a two-dimensional vortex lattice, and significantly affecting the behavior of superconductors. Most importantly, these vortices can be pushed around by flowing electrical current, causing superconductivity to dissipate. The point when these vortices first begin to penetrate a superconductor is called the lower critical field, one that's been notoriously difficult to measure due to a distortion of the magnetic field near sample edges. However, knowledge of this field is needed for better understanding and controlling superconductors for use in applications. "The boundary line, the temperature-dependent value of the magnetic field at which this happens, is very important; the presence of Abrikosov vortices changes the behavior of the superconductor a great deal," said Ruslan Prozorov, an Ames Laboratory physicist who is an expert in superconductivity and magnetism. "Many of the applications for which we'd like to use superconductivity, like the transmission of electricity, are hindered by the existence of this vortex phase." To validate the novel technique developed to measure this boundary line, Prozorov and his team probed three already well-studied superconducting materials. 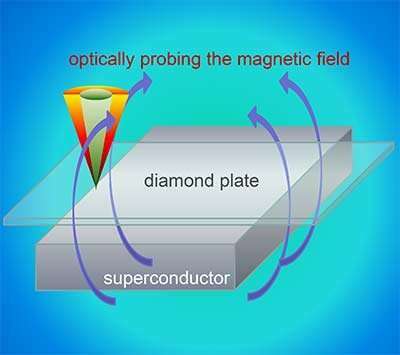 They used a recently developed optical magnetometer that takes advantage of the quantum state of a particular kind of an atomic defect, called nitrogen-vacancy (NV) centers, in diamond. The highly sensitive instrument allowed the scientists to measure very small deviations in the magnetic signal very close to the sample edge detecting the onset of vortices penetration. "Our method is non-invasive, very precise and has better spatial resolution than previously used methods," said Prozorov. In addition, theoretical calculations conducted together with another Ames Laboratory scientist, Vladimir Kogan, allowed extraction of the lower critical field values from the measured onset of vortex penetration.